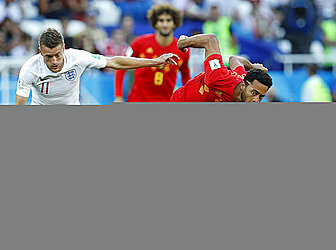 KALININGRAD, Russia (AP) — England barely seemed troubled by losing. Belgium appeared to be a reluctant winner. Belgium did collect the three points, beating England 1-0, and secured first place in the group on Adnan Januzaj's curling shot. But that might not turn out to be the desirable outcome since the victory diverted Belgium onto the tougher potential path to the final. Thanks to a pair of opening victories for both, England and Belgium entered the Group G match knowing they were already in the second round. Belgium made nine changes and still won. England lost the top spot after dropping Harry Kane, the tournament's leading scorer, and seven others. "We don't suffer for (the loss)," Southgate said. "When you are a leader and a manager you have to make decisions that are right for your group and your primary objectives. Sometimes those decisions will be criticized ... but you have to think about the bigger picture." For Southgate, it was as much about ensuring players like Kane did not pick up injuries in a game that wasn't essential. The leading scorer in Russia with five goals watched the match from the bench. So did Romelu Lukaku, who has scored four for Belgium. "We don't like to lose, but tonight there were other factors that were more important," Southgate said. "We know our strongest 11, but what's pleasing is that there are guys that have put their hand up tonight to really push for a place." On the other end, Kane's replacement up front for England, Jamie Vardy, tried his luck with a header. Marcus Rashford came closest for England at the start of the second half but his low shot was tipped around the post by Belgium goalkeeper Thibaut Courtois. If the script was to avoid winning, Januzaj didn't read it. Picking up possession on the edge of the penalty area, he shifted the ball around Danny Rose and curled it into the corner of the net in the 51st minute. "In England I had a lot of criticism. Now I wanted to show people I'm here," the 23-year-old Januzaj said. "I've been putting in a lot of work." England ended up with the potentially more difficult match in the round of 16, even though the country's national team hasn't won a knockout-stage game at any tournament since 2006.